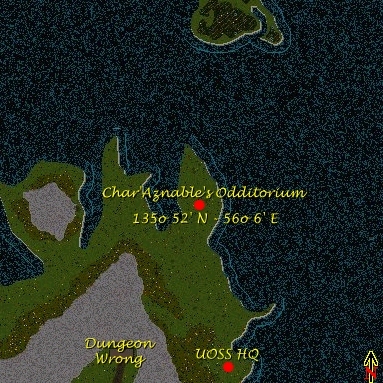 Just to the north of Dungeon Wrong and UOSS HQ. History: This place is a place that one would have to see with their own eyes to behold the spectacle that this place truly does hold. The owner, Char’Aznable, has been able to get his hands on everything that this land has to offer and if it isnt there, Im quite sure he will get it. 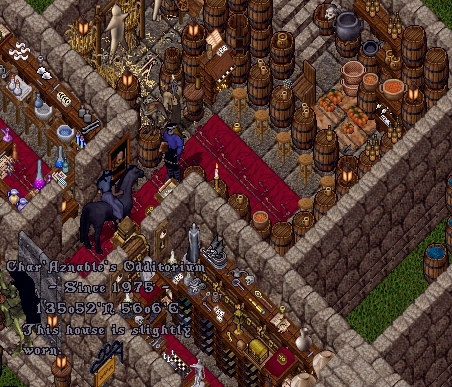 This place was pointed out to me by Nefertete as I was taking a tour of Swamp Village and Im glad I stayed that much longer to wait and see the Odditorium. If one tried to count all the rare and odd things and objects thy eyes would cross and thy fingers would knot, its that many. It was said that Char’Aznable holds periodic events of various types and has been quite generous in the awards department. Certainly something to look out for in the future, but I hope the rumors of people having squawbles over the awards is nay true. If at all anything, come on and check the place out and be amwazed for thyself.